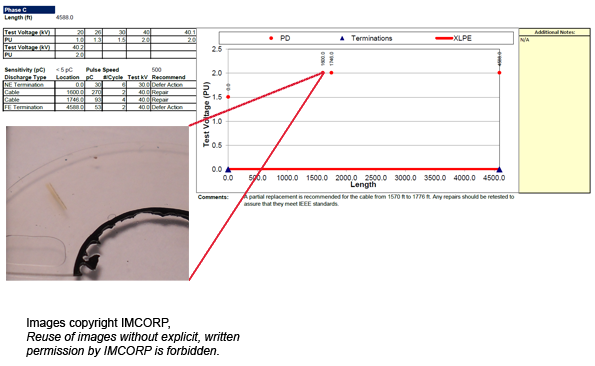 IMCORP was conducting a Factory Grade® assessment on a cable system when this pair of defects was pinpointed. The defects were located less than 45 meters (150 feet) apart and appeared to be in cable insulation. Following IMCORP’s recommendations, the site owner removed the defects. The section was replaced with new cable and a pair of splices. The new complete cable system was reassessed and passed all pertinent manufacturers’ standards for partial discharge activity. The defects were sent to IMCORP for a comprehensive laboratory root cause analysis. This analysis found ambers in the cable insulation. An amber is essentially overheated cable insulation material that gets embedded in the insulation during the extrusion process (a cross section of one of the ambers can be seen in the image above). Ambers are not usually a significant problem, but in two specific locations on this cable, they had delaminated from the surrounding insulation. The delamination introduced voids which were the source of the sub-standard partial discharge activity. This is a serious defect considering the void spanned over twenty-five percent of the cable insulation.